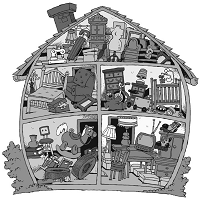 Hoarding - Fact or Fiction? The OC Hoarding Task Force meets monthly on the 3rd Thursday (dark in December) at the Council on Aging Orange County office located at 2 Executive Circle, Suite 175, Irvine, CA 92714. The Orange County Task Force on Hoarding partners with the Mental Health Association of Orange County. Copyright © Orange County Task Force on Hoarding, All rights reserved.